Fall 2013 Field School Begins! Home|Fall 2013 Field School Begins! 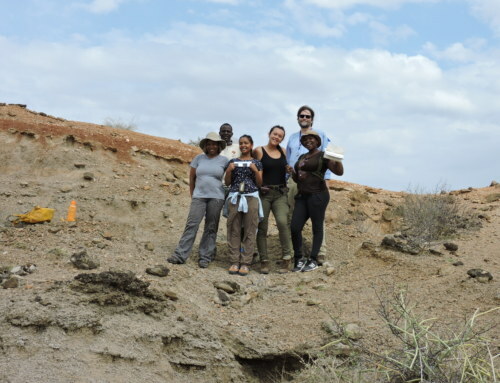 The Turkana Basin Field School for Fall 2013 has begun! 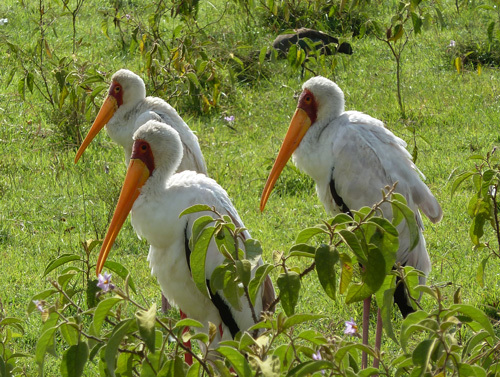 The students made their long journey to Kenya from New York and set off on a short safari into the Great Rift Valley to Lake Elementeita, Lake Nakuru and Lake Naivasha. 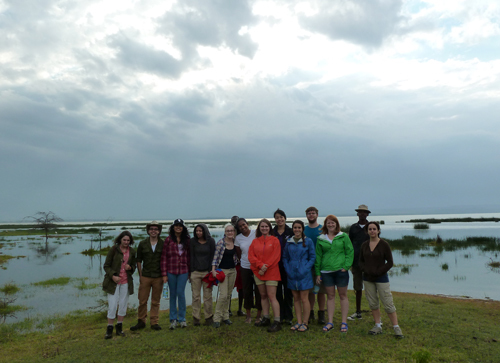 We started at Lake Elementeita in the Rift Valley where we went for a short walk in the evening. 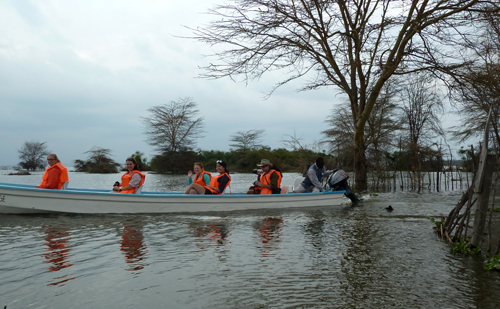 All of the Kenyan central Great Rift Valley lakes are particularly high at present. This is mainly due to the large amounts of rainfall that have been experienced over the past couple of years. The students were lucky to see the lake at this high point as it is a good example of how lake boundaries and shorelines change through time. 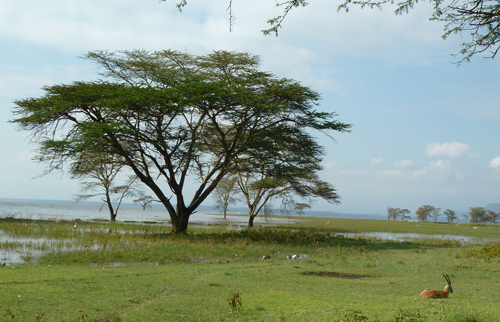 Lake Elementeita and Lake Nakuru are both typically alkaline lakes that support a distinctive community of algae and a unique food-chain that includes flamingoes. 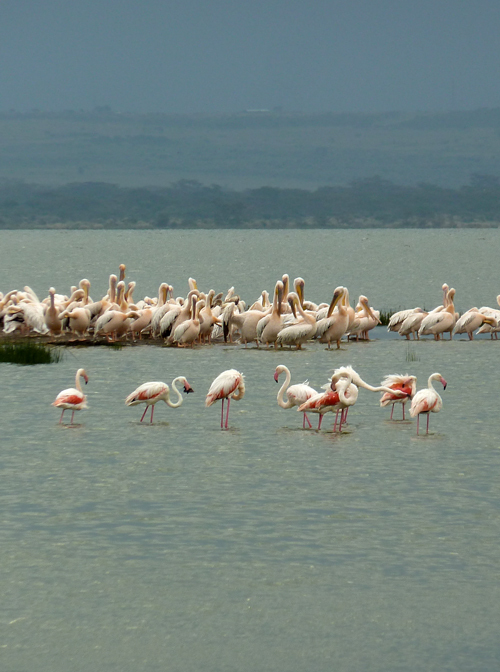 The flamingoes migrate along the Great Rift Valley lakes. 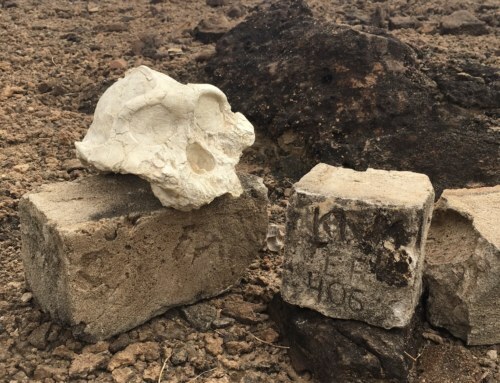 One recent discovery about the Lesser Flamingoes in the Kenyan Rift Valley showed that an individual bird ringed (banded) several decades ago had lived for over 50 years! 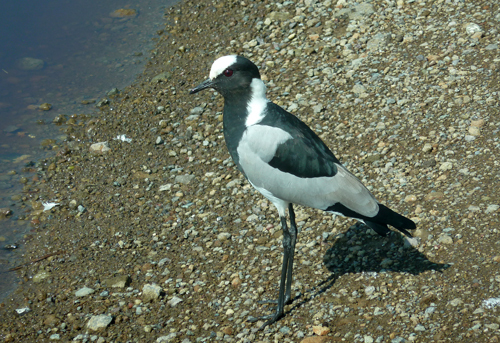 There were fewer flamingoes present as the more dilute conditions of the lakes at present means that there is less algae available for them to eat. But there were large numbers of pelicans around who seem to be enjoying the flooded lakes. 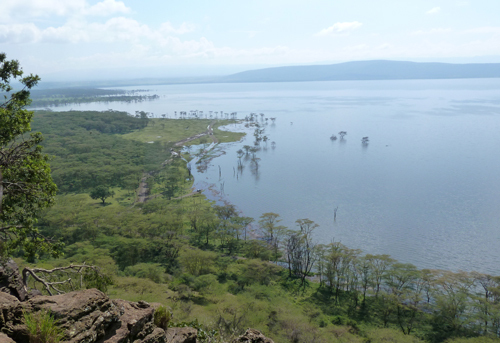 We then travelled north further along the Rift Valley to Lake Nakuru. 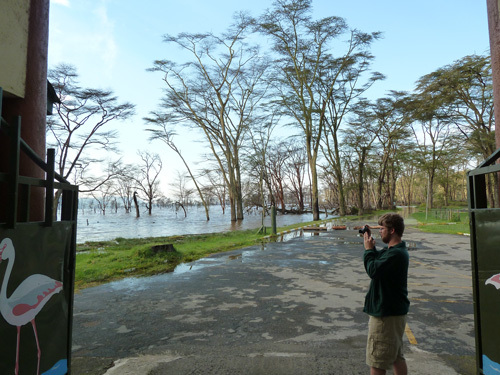 Here we visited Lake Nakuru National Park – where the lake has also been rising and has even swamped the regular entrance to the national park’s headquarters! 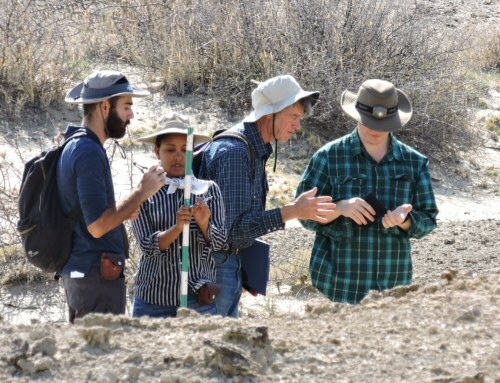 The students got to learn about some of the different interactions that they will be studying as part of the first module (Ecology). 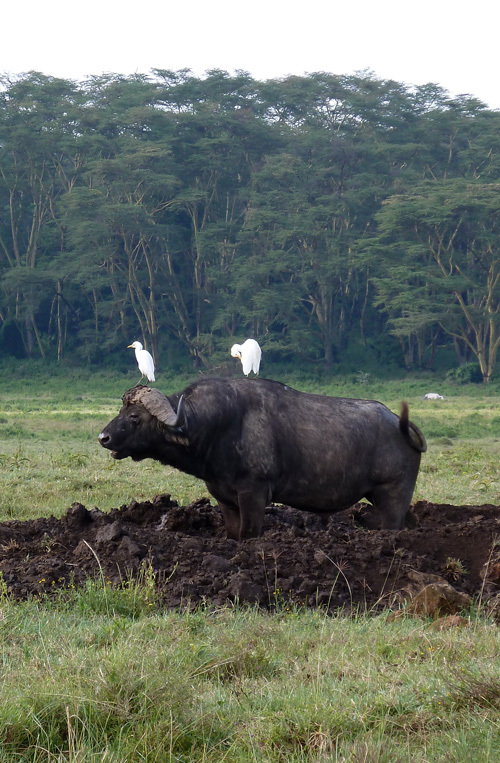 Cattle Egrets typically hang around large mammals feeding on insects that they disturb. They sometimes pick the odd pesky fly off an animal, but for the most part this relationship seems to be weighted in favour of the birds! At the edges of Baboon Cliffs we came across this odd couple sunning themselves on the rocks: a Rock Hyrax and a Red-Headed Rock Agama lizard (this is a male with the bright colours). 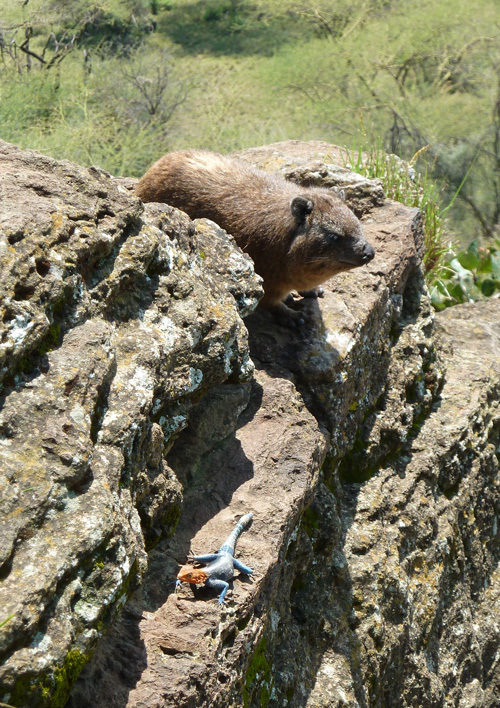 Students got to see first hand some interesting features of the hyrax that they will be learning more about later during the field school. 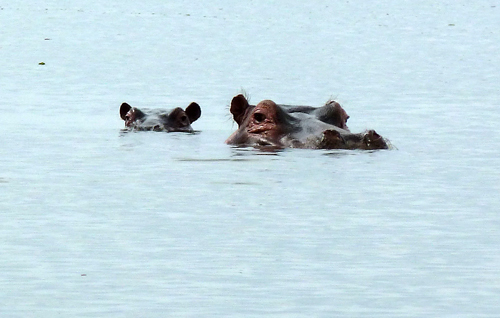 We continued skirting around the lakeshore of Nakuru, where the sunlight glistened on the water and contented animals basked in the green grass. We talked about the remarkable and beautiful ‘Fever Trees’ that grow in this part of the Rift Valley and were wrongly blamed and hence named, as a possibly cause of malaria – one of the subjects that we will be exploring in more depth over the next couple of weeks. 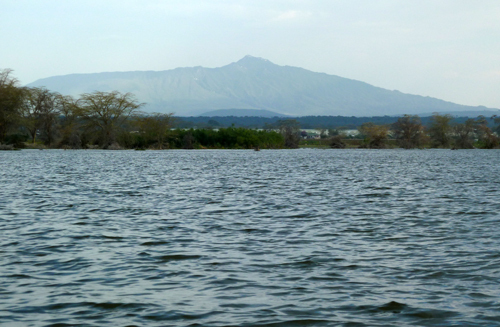 Lake Naivasha is a freshwater lake that has a diverse plant and animal community as is also one of Kenya’s main horticultural areas where flowers and vegetables are grown for export. 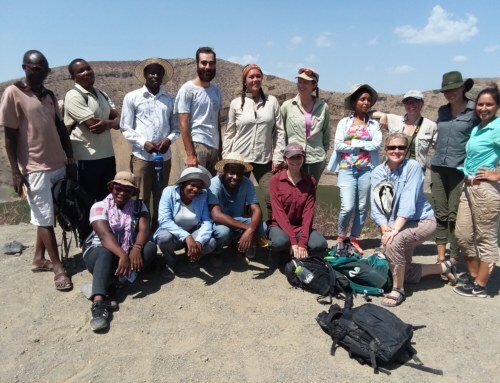 Check back soon for more updates from the Turkana Basin Field School! 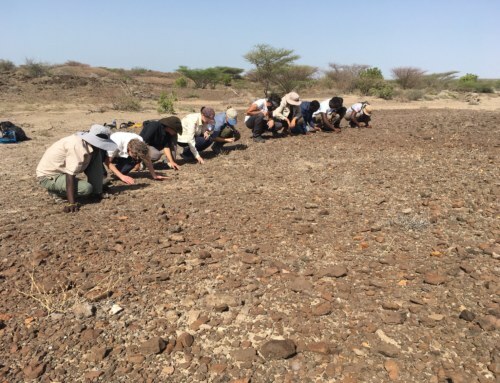 By Dr. Dino Martins|2017-01-04T18:05:06-07:00September 8th, 2013|Field Schools|Comments Off on Fall 2013 Field School Begins!